As anyone who spends time around children knows, they generally delight in things that adults find yucky. 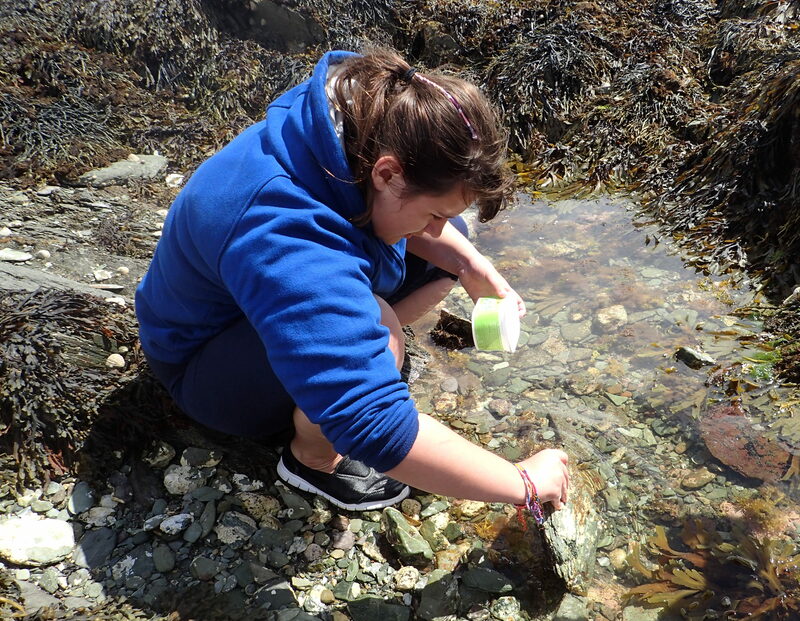 So, what better for a day out with Cornish Rock Pools Junior than a visit to a sheltered, silty shore? It’s the perfect environment for all things slimy. It didn’t take us long to find one of the strangest – and stinkiest – animals on the shore, the bootlace worm. We turned a stone and on one side was the head and part of the tangled body of the brown worm. The rest of the body spanned across to the next boulder like a rope bridge. The long, thin body of a bootlace worm stretched between two rocks. The bootlace worm is massively long – the longest recorded apparently came in at 55 metres, making it the longest animal in the Guinness Book of Records. This one would probably have spanned at least 7 metres. Given the difficulties of unravelling the tangled body without breaking it coupled with the fact it exudes acrid-smelling, toxic mucus, we decided against measuring it. On another rock we found a prettier creature, the candy-stripe flat worm. This one had moulded its paper-thin body to the contours of the rock. When they’re not oozing along like this, they’re reasonable swimmers, albeit with a technique that resembles a tissue blowing along the pavement. A small candy stripe flatworm oozing along its way. We started the search for jellies. The sheltered clumps of seaweed seemed a likely spot for stalked jellies, although Junior’s fascination with kicking up ‘pyroclastic flows’ of silt did hamper visibility a little. For a while we found nothing but ‘snotworm’ eggs, the green eggclumps of the green leaf worm. When we did find our first jelly blob, it turned out to be another kiddy favourite, a slug. Out of the water, it was a shapeless splodge of yellow. In the water, it stretched out its white body to display yellow stripes and various yellow appendages and antennae. As we watched the Polycera quadrilineata slug’s slow progress along the seaweed, we noticed another, more flowery jelly-blob behind it. This was the first of several Lucernariopsis cruxmelitensis stalked jellyfish we found. Stalked jellyfish – a Lucernariopsis cruxmelitensis. The incoming current was throwing up a cloud of silt, but we managed to find eight stalked jellies among this small area of the shore. Not a bad haul of squidgy, slimy, child-pleasing creatures. Stalked jellies have stinging tentacles like their cousins, the jellyfish, but live attached to seaweed rather than floating in the ocean. A sea spider. These delicate little creatures are perfectly camouflaged among the seaweed. Tubulanus annulatus. This strikingly coloured worm was a first for me and is more commonly seen offshore. I was right at the depth-limit for my wellies when I found this topknot flat fish scooting along the bottom of a pool. Junior loves their asymmetrical faces. More slime! Cowries are able to dangle from the rocks using their strong mucus trails. This one’s in typical abseiling position. We’ve been planning this trip since our visitors first came to Cornwall a year ago. They’re determined to try rock pooling having missed out last time. This week the tides are perfect. They live near the sea back home in Essex, but they tell me it’s not the same and I can well believe it. They’ve never seen a starfish in the wild before. My mission is clear. 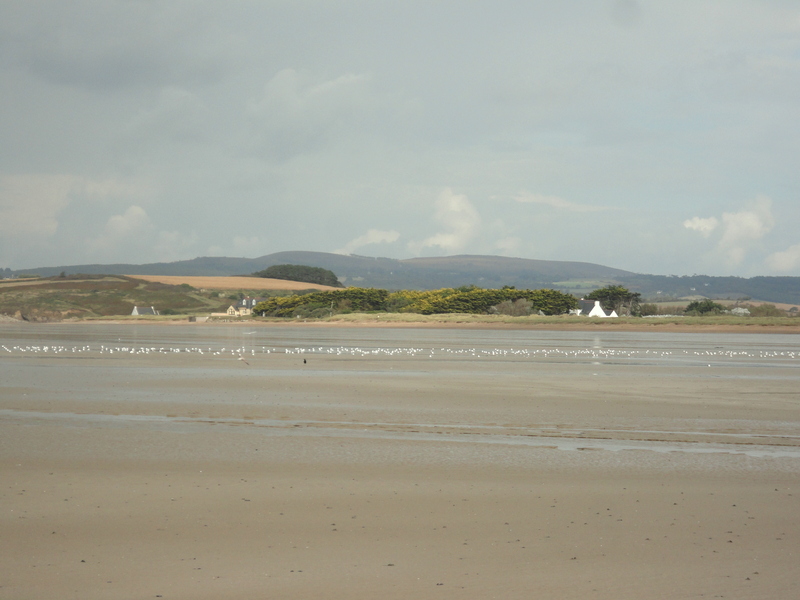 With picnic and buckets in hand, we set out, treading gingerly over seaweed and searching among the rocks. Within minutes, our friends are putting yesterday’s hasty tutorial on crabs into practice as they try picking them up safely. They score top marks on this and on working out whether the crabs are male or female from the shape of their tails. 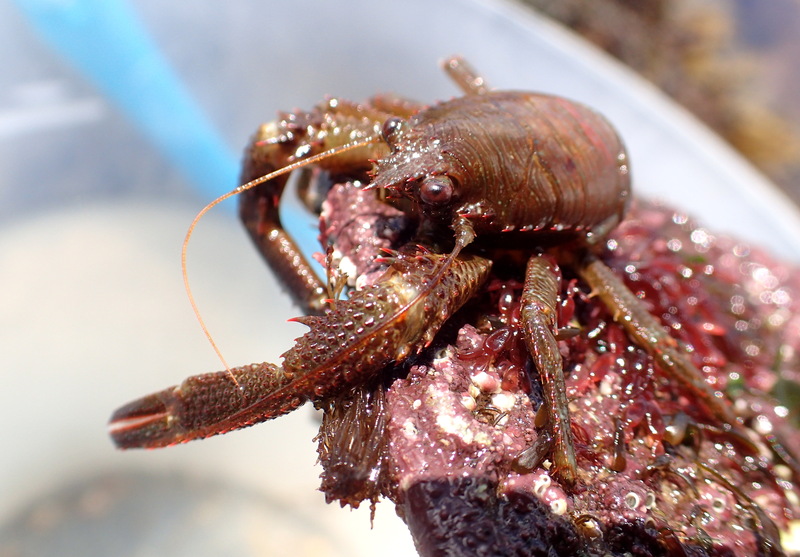 We find several species of crustacean, including this large squat lobster. My son loves the beach at Sainte Anne la Palud; wild dunes stretch towards a distant headland and the sand is perfect for building his creations. It’s why we return here at the end of our holiday in Brittany. Last time we came it was a high spring tide and the beach was just a sliver of sand strewn with prickly cockles, sea potato urchins and even a dead eel. Now the sea is at its very lowest, a bare glimmer on the horizon. I walk towards distant low cliffs, expecting to find mussel beds around the exposed headland.